From trendy to classic, these products are our stylists’ favorites for gorgeous hair. 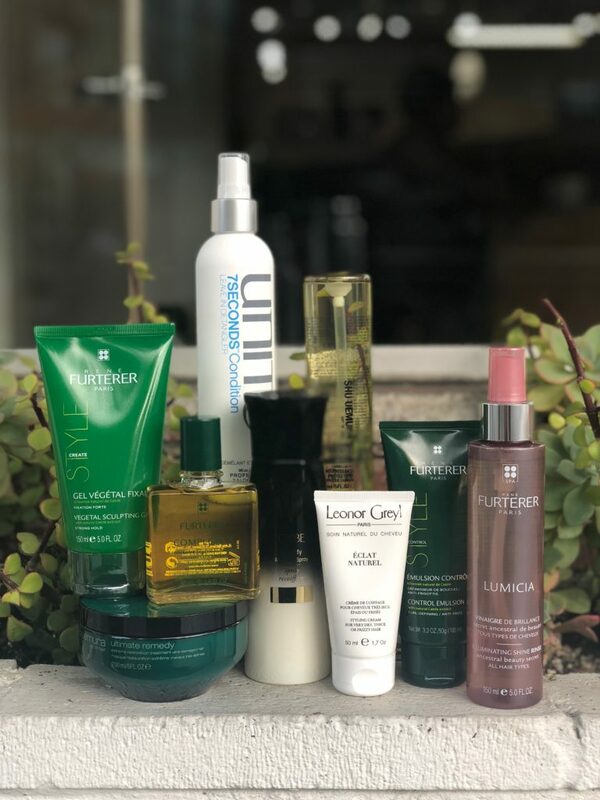 As the best salon in San Francisco, our stylists know that picking the perfect products to fit your hair needs can be overwhelming, and the choice of products on our shelves is extensive. While we always recommend asking your stylist and colorist for their suggestions (they do know your hair best, after all), we’ve also put together a handy list of must-haves. Works Best For: People on the move. Products come and go according to trends and the looks of the moment, but some things are here for the long haul and become a classic “must-have” item, as is the case with Leonor Greyl’s Éclat Naturel. It simulates the weight of sebum, so it is able to define and take the fluff out of hair in a natural way. It is easy to apply—you only need a pea-sized amount—and is portable so you can stash one in your bag. Works Best For: Anyone who wants to accentuate natural waves without heat styling. It’s great to cocktail with leave-in conditioners or curl creams (or basically anything) to give it added definition and make it extra beachy. Works Best For: Great for removing build-up from scalp. This vinegar-based spray works as an effective clarifier without the use of detergents that can strip or dry out hair. To use, spray liberally on freshly washed hair and emulsify all over. For the ultimate scalp detox, begin with Complexe 5 Stimulating Plant Extract prior to shampooing on dry, unwashed hair. For best results, use once a week. Works Best For: This game-changing product turns baby-fine curls into chunkier texture with body while eliminating frizz—sans crunch (because of the pomade mousse). For next-day hair, run your hands under water, scrunch hair and add a little more Aircraft to reactivate curls. Works Best For: Prolong your style while protecting your strands. Spray the restyling spray onto your hair for heat protection up to 450 degrees and then proceed with the curling iron or flat iron. The next day, however, is when the real magic happens. You can spray your hair again, scrunch or brush it—and viola—it brings back the style from the day before. Also, if you have curly hair, you can spray it in the next day and bring those spirals back to life. Works Best For: This strong-hold gel has a clean, light smell and holds over-processed curls in perfect order. Blow-dry your hair for a lifted root and added volume. Works Best For: This nourishing protective oil is a superstar when dealing with dryness. Enriched with camellia oil, Essence Absolue protects your hair from heat and harmful UV rays while maintaining beautiful shine and softness. This product can be used on wet or dry hair and can even be left in overnight as a treatment for that extra boost of hydration. Works Best For: Those who want to stimulate healthy hair growth. It deep cleans any sebum/oil build-up at the follicle, which can lead to hair loss, and removes lingering product. Once a week, apply this oil directly to your dry, dirty scalp and then massage it in. Leave it on for 15 minutes and wash your hair and go. Also, using Complexe 5 Stimulating Plant Extract prior to any René Furterer scalp treatments improves their absorbency and effectiveness by ten-fold. Works Best For: Maintain healthy hair, especially when going lighter. It replenishes strength lost from the highlight service while also moisturizing the hair and making it feel soft. Works Best For: A long-lasting soft blow dry without feeling sticky or stiff. Enriched with Japanese cedar bud, it’s extremely versatile and can be used on all types of hair. This product can standalone or it can be blended with Satin Design Anti-Frizz Blow Dry Lotion or Essence Absolue Oil (both Shu Uemura products as well) for the perfect blow dry. Apply 1-2 golf ball-sized puffs to damp hair evenly from roots-to-ends and comb it through. Then, blow-dry it like you normally would. Stop by any of our five locations to grab these game-changing products. Or talk to your stylist about the products right for you at your next appointment.